A fragment of a large bone, probably from a mammoth, Pat Shipman reports, was placed in this dog’s mouth shortly after death. This finding suggests the animal was according special mortuary treatment, perhaps acknowledging its role in mammoth hunting. The fossil comes from the site of Predmosti, in the Czech republic, and is about 27,000 years B.P. old. This object is one of three canid skulls from Predmosti that were identified as dogs based on analysis of their morphology. Photo credit: Anthropos Museum, Brno, the Czech Republic, courtesy of Mietje Germonpre. 29 May 2014 — A new analysis of European archaeological sites containing large numbers of dead mammoths and dwellings built with mammoth bones has led Penn State Professor Emerita Pat Shipman to formulate a new interpretation of how these sites were formed. 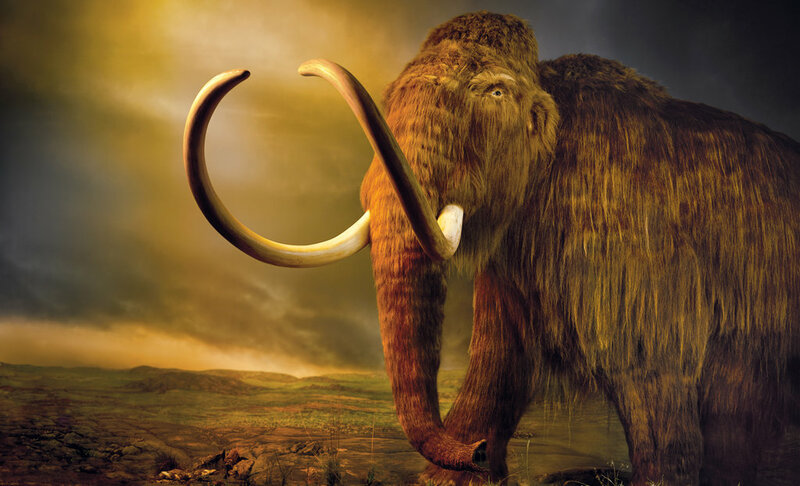 She suggests that their abrupt appearance may have been due to early modern humans working with the earliest domestic dogs to kill the now-extinct mammoth — a now-extinct animal distantly related to the modern-day elephant. Shipman’s analysis also provides a way to test the predictions of her new hypothesis. Advance publication of her article “How do you kill 86 mammoths?” is available online throughQuaternary International. These maps show the locations of collections of mammoth bones at the archaeological sites that Pat Shipman analyzed in her paper that will be published in the journal Quaternary International. Credit: Jeffrey Mathison. The photo shows part of the very-high-density concentration of mammoth bones at the Krakow-Spadzista Street archaeological site. Credit line Piotr Wojtal. The first time Ben Novak saw a passenger pigeon, he fell to his knees and remained in that position, speechless, for 20 minutes. He was 16. At 13, Novak vowed to devote his life to resurrecting extinct animals. At 14, he saw a photograph of a passenger pigeon in an Audubon Society book and “fell in love.” But he didn’t know that the Science Museum of Minnesota, which he was then visiting with a summer program for North Dakotan high-school students, had them in their collection, so he was shocked when he came across a cabinet containing two stuffed pigeons, a male and a female, mounted in lifelike poses. He was overcome by awe, sadness and the birds’ physical beauty: their bright auburn breasts, slate-gray backs and the dusting of iridescence around their napes that, depending on the light and angle, appeared purple, fuchsia or green. Before his chaperones dragged him out of the room, Novak snapped a photograph with his disposable camera. The flash was too strong, however, and when the film was processed several weeks later, he was haunted to discover that the photograph hadn’t developed. It was blank, just a flash of white light. In the decade since, Novak has visited 339 passenger pigeons — at the Burke Museum in Seattle, the Carnegie Museum of Natural History in Pittsburgh, the American Museum of Natural History in New York and Harvard’s Ornithology Department, which has 145 specimens, including eight pigeon corpses preserved in jars of ethanol, 31 eggs and a partly albino pigeon. There are 1,532 passenger-pigeon specimens left on Earth. On Sept. 1, 1914, Martha, the last captive passenger pigeon, died at the Cincinnati Zoo. She outlasted George, the penultimate survivor of her species and her only companion, by four years. As news spread of her species’ imminent extinction, Martha became a minor tourist attraction. In her final years, whether depressed or just old, she barely moved. Underwhelmed zoo visitors threw fistfuls of sand at her to elicit a reaction. When she finally died, her body was taken to the Cincinnati Ice Company, frozen in a 300-pound ice cube and shipped by train to the Smithsonian Institution, where she was stuffed and mounted and visited, 99 years later, by Ben Novak. The fact that we can pinpoint the death of the last known passenger pigeon is one of many peculiarities that distinguish the species. Many thousands of species go extinct every year, but we tend to be unaware of their passing, because we’re unaware of the existence of most species. The passenger pigeon’s decline was impossible to ignore, because as recently as the 1880s, it was the most populous vertebrate in North America. It made up as much as 40 percent of the continent’s bird population. In “A Feathered River Across the Sky,” Joel Greenberg suggests that the species’ population “may have exceeded that of every other bird on earth.” In 1860, a naturalist observed a single flock that he estimated to contain 3,717,120,000 pigeons. By comparison, there are currently 260 million rock pigeons in existence. A single passenger-pigeon nesting ground once occupied an area as large as 850 square miles, or 37 Manhattans. The species’ incredible abundance was an enticement to mass slaughter. The birds were hunted for their meat, which was sold by the ton (at the higher end of the market, Delmonico’s served pigeon cutlets); for their oil and feathers; and for sport. Even so, their rapid decline — from approximately five billion to extinction within a few decades — baffled most Americans. Science magazine published an article claiming that the birds had all fled to the Arizona desert. Others hypothesized that the pigeons had taken refuge in the Chilean pine forests or somewhere east of Puget Sound or in Australia. Another theory held that every passenger pigeon had joined a single megaflock and disappeared into the Bermuda Triangle. Stewart Brand, who was born in Rockford, Ill., in 1938, has never forgotten the mournful way his mother spoke about passenger pigeons when he was a child. During summers, the Brands vacationed near the top of Michigan’s mitten, not far from Pigeon River, one of the hundreds of American places named after the species. (Michigan alone has four Pigeon Rivers, four Pigeon Lakes, two Pigeon Creeks, Pigeon Cove, Pigeon Hill and Pigeon Point). Old-timers told stories about the pigeon that to Brand assumed a mythic quality. They said that the flocks were so large they blotted out the sun. Brand’s compassion for the natural world has taken many diverse forms, but none more broadly influential than the Whole Earth Catalog, which he founded in 1968 and edited until 1984. Brand has said that the catalog, a dense compendium of environmentalist tools and practices, among other things, “encouraged individual power.” As it turned out, Whole Earth’s success gave Brand more power than most individuals, allowing him intimate access to the world’s most imaginative thinkers and patrons wealthy enough to finance those thinkers’ most ambitious ideas. In the last two decades, several of these ideas have materialized under the aegis of the Long Now Foundation, a nonprofit organization that Brand helped to establish in 1996 to support projects designed to inspire “long-term responsibility.” Among these projects are a 300-foot-tall clock designed to tick uninterruptedly for the next 10,000 years, financed by a $42 million investment from the Amazon.com founder Jeff Bezos and situated inside an excavated mountain that Bezos owns near Van Horn, Tex. ; and a disk of pure nickel inscribed with 1,500 languages that has been mounted on the Rosetta space probe, which this year is scheduled to land on Comet 67P/Churyumov-Gerasimenko, 500 million miles from earth. Dear Ed and George . . . The death of the last passenger pigeon in 1914 was an event that broke the public’s heart and persuaded everyone that extinction is the core of humanity’s relation with nature. George, could we bring the bird back through genetic techniques? I recall chatting with Ed in front of a stuffed passenger pigeon at the Comparative Zoology Museum [at Harvard, where Wilson is a faculty emeritus], and I know of other stuffed birds at the Smithsonian and in Toronto, presumably replete with the requisite genes. Surely it would be easier than reviving the woolly mammoth, which you have espoused. The environmental and conservation movements have mired themselves in a tragic view of life. 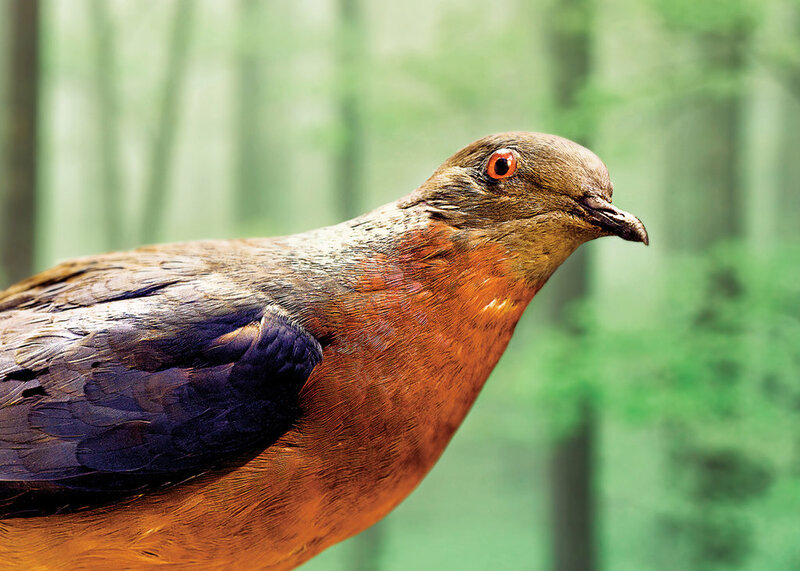 The return of the passenger pigeon could shake them out of it — and invite them to embrace prudent biotechnology as a Green tool instead of menace in this century. . . . I would gladly set up a nonprofit to fund the passenger pigeon revival. . . .
Wild scheme. Could be fun. Could improve things. It could, as they say, advance the story. Passenger Pigeon Extinct 1914. Billions of the pigeons were alive just a few decades earlier. Like the other animals shown here, it has been proposed for de-extinction projects. Credit Stephen Wilkes for The New York Times. Passenger pigeon, Museum of Comparative Zoology, Harvard University. In less than three hours, Church responded with a detailed plan to return “a flock of millions to billions” of passenger pigeons to the planet. In February 2012, Church hosted a symposium at Harvard Medical School called “Bringing Back the Passenger Pigeon.” Church gave a demonstration of his new genome-editing technology, and other biologists and avian specialists expressed enthusiasm for the idea. “De-extinction went from concept to potential reality right before our eyes,” said Ryan Phelan, Brand’s wife, an entrepreneur who founded an early consumer medical-genetics company. “We realized that we could do it not only for the passenger pigeon, but for other species. There was so much interest and so many ideas that we needed to create an infrastructure around it. It was like, ‘Oh, my God, look at what we’ve unleashed.’ ” Phelan, 61, became executive director of the new project, which they named Revive & Restore. Several months later, the National Geographic Society hosted a larger conference to debate the scientific and ethical questions raised by the prospect of “de-extinction.” Brand and Phelan invited 36 of the world’s leading genetic engineers and biologists, among them Stanley Temple, a founder of conservation biology; Oliver Ryder, director of the San Diego Zoo’s Frozen Zoo, which stockpiles frozen cells of endangered species; and Sergey Zimov, who has created an experimental preserve in Siberia called Pleistocene Park, which he hopes to populate with woolly mammoths. Behind the biohazard signs and double-encoded security doors that mark the entrance of the paleogenomics lab at the University of California, Santa Cruz, I found no mastodon tusks, dinosaur eggs or mosquitoes trapped in amber — only a sterile, largely empty room in which Novak and several graduate students were busy checking their Gmail accounts. The only visible work in progress was Metroplex, a giant Transformers figurine that Novak constructed, which was hunched over his keyboard like a dead robot. Novak, who is 27, hastened to assure me that the construction of the passenger-pigeon genome was also underway. In fact, it had been for years. Beth Shapiro, one of the scientists who runs the lab, began to sequence the species’ DNA in 2001, a decade before Brand had his big idea. The sequencing process is now in its data-analysis phase, which leaves Novak, who studied ecology in college, but has no advanced scientific degrees, time to consult on academic papers about de-extinction, write his own paper about the ecological relationship between passenger pigeons and chestnut trees and correspond with the scientists behind the world’s other species-resurrection efforts. These include the Uruz project, which is selectively breeding cattle to create a new subspecies that resembles aurochs, a form of wild ox, extinct since 1627; a group hoping to use genetic methods to revive the heath hen, extinct since 1932; and the Lazarus Project, which is trying to revive an Australian frog, extinct for 30 years, that gave birth through its mouth. When Novak joined Shapiro’s lab, he knew nothing about Santa Cruz and nobody there. A year later, apart from an occasional dinner on the Brands’ tugboat in Sausalito, little has changed. Novak is largely left alone with his thoughts and his dead animals. But it has always been this way for Novak, who grew up in a house three miles from his closest neighbor, halfway between Williston, the eighth-largest city in North Dakota, and Alexander, which has a population of 269. As a boy, Novak often took solitary hikes through the badlands near his home, exploring a vast petrified forest that runs through the Sentinel Butte formation. Fifty million years ago, that part of western North Dakota resembled the Florida Everglades. Novak frequently came across vertebrae, phalanges and rib fragments of extinct crocodiles and champsosaurs. 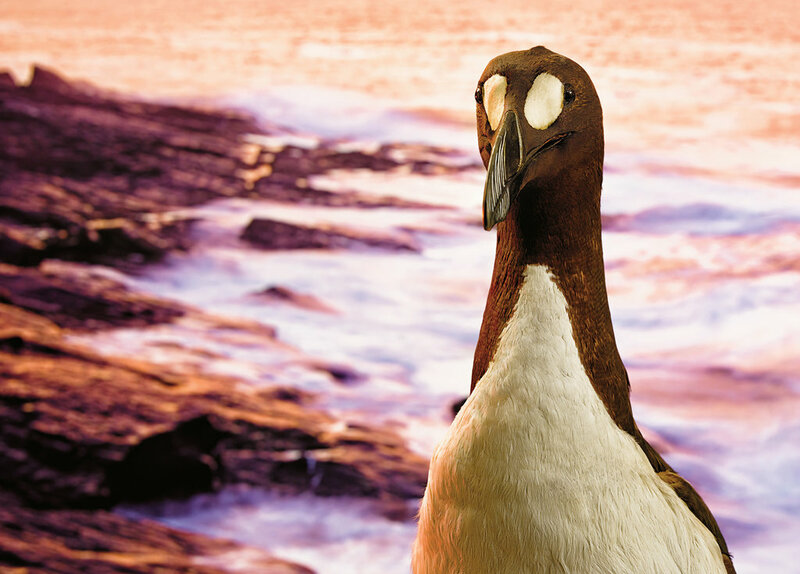 Great Auk Not seen since 1844, when Icelandic fishermen strangled the last known survivors. Credit Stephen Wilkes for The New York Times. Great Auk, Museum of Comparative Zoology, Harvard University. After graduating from Montana State University in Bozeman, Novak applied to study under Beth Shapiro, who had already begun to sequence passenger-pigeon DNA. He was rejected. “I appreciated his devotion to the bird,” she told me, “but I worried that his zeal might interfere with his ability to do serious science.” Novak instead entered a graduate program at the McMaster Ancient DNA Center in Hamilton, Ontario, where he worked on the sequencing of mastodon DNA. But he remained obsessed by passenger pigeons. He decided that, if he couldn’t join Shapiro’s lab, he would sequence the pigeon’s genome himself. He needed tissue samples, so he sent letters to every museum he could find that possessed the stuffed specimens. He was denied more than 30 times before Chicago’s Field Museum sent him a tiny slice of a pigeon’s toe. A lab in Toronto conducted the sequencing for a little more than $2,500, which Novak raised from his family and friends. He had just begun to analyze the data when he learned about Revive & Restore. After Novak was hired, Shapiro offered him office space at the U.C.S.C. paleogenomics lab, where he could witness the sequencing work as it happened. Now, when asked what he does for a living, Novak says that his job is to resurrect the passenger pigeon. Novak is tall, solemn, polite and stiff in conversation, until the conversation turns to passenger pigeons, which it always does. One of the few times I saw him laugh was when I asked whether de-extinction might turn out to be impossible. He reminded me that it has already happened. More than 10 years ago, a team that included Alberto Fernández-Arias (now a Revive & Restore adviser) resurrected a bucardo, a subspecies of mountain goat also known as the Pyrenean ibex, that went extinct in 2000. The last surviving bucardo was a 13-year-old female named Celia. Before she died — her skull was crushed by a falling tree — Fernández-Arias extracted skin scrapings from one of her ears and froze them in liquid nitrogen. Using the same cloning technology that created Dolly the sheep, the first cloned mammal, the team used Celia’s DNA to create embryos that were implanted in the wombs of 57 goats. One of the does successfully brought her egg to term on July 30, 2003. “To our knowledge,” wrote the scientists, “this is the first animal born from an extinct subspecies.” But it didn’t live long. After struggling to breathe for several minutes, the kid choked to death. Shapiro hopes to complete this part of the process in the coming months. At that point, the researchers will have, on their hard drives, a working passenger-pigeon genome. If you opened the file on a computer screen, you would see a chain of 1.2 billion letters, all of them A, G, C or T. Shapiro hopes to publish an analysis of the genome by Sept. 1, in time for the centenary of Martha’s death. That, unfortunately, is the easy part. Next the genome will have to be inscribed into a living cell. This is even more complicated than it sounds. Molecular biologists will begin by trying to culture germ cells from a band-tailed pigeon. Cell culturing is the process by which living tissue is made to grow in a petri dish. Bird cells can be especially difficult to culture. They strongly prefer not to exist outside of a body. “For birds,” Novak said, “this is the hump to get over.” But it is largely a question of trial and error — a question, in other words, of time, which Revive & Restore has in abundance. The biologists would next introduce these living cells into a band-tailed-pigeon embryo. No hocus-pocus is involved here: You chop off the top of a pigeon egg, inject the passenger-pigeon cells inside and cover the hole with a material that looks like Saran wrap. The genetically engineered germ cells integrate into the embryo; into its gonads, to be specific. When the chick hatches, it should look and act like a band-tailed pigeon. But it will have a secret. If it is a male, it carries passenger-pigeon sperm; if it is a female, its eggs are passenger-pigeon eggs. These creatures — band-tailed pigeons on the outside and passenger pigeons on the inside — are called “chimeras” (from the Middle English for “wild fantasy”). Chimeras would be bred with one another in an effort to produce passenger pigeons. Novak hopes to observe the birth of his first passenger-pigeon chick by 2020, though he suspects 2025 is more likely. At that point, the de-extinction process would move from the lab to the coop. Developmental and behavioral biologists would take over, just in time to answer some difficult questions. Chicks imitate their parents’ behavior. How do you raise a passenger pigeon without parents of its own species? And how do you train band-tailed pigeons to nurture the strange spawn that emerge from their eggs; chicks that, to them, might seem monstrous: an avian Rosemary’s Baby? Despite the genetic similarity between the two pigeon species, significant differences remain. Band-tailed pigeons are a western bird and migrate vast distances north and south; passenger pigeons lived in the eastern half of the continent and had no fixed migration patterns. In order to ease the transition between band-tailed parents and passenger chicks, a Revive & Restore partner will soon begin to breed a flock of band-tailed pigeons to resemble passenger pigeons. They will try to alter the birds’ diets, migration habits and environment. The behavior of each subsequent generation will more closely resemble that of their genetic cousins. “Eventually,” Novak said, “we’ll have band-tailed pigeons that are faux-passenger-pigeon parents.” As unlikely as this sounds, there is a strong precedent; surrogate species have been used extensively in pigeon breeding. During the breeding process, small modifications would be made to the genome in order to ensure genetic diversity within the new population. After three to five years, some of the birds would be moved to a large outdoor aviary, where they would be exposed to nature for the first time: trees, weather, bacteria. Small-population biologists will be consulted, as will biologists who study species reintroduction. Other animals would gradually be introduced into the aviary, one at a time. The pigeons would be transferred between aviaries to simulate their hopscotching migratory patterns. Ecologists will study how the birds affect their environment and are affected by it. After about 10 years, some of the birds in the aviary would be set free into the wild, monitored by G.P.S. chips implanted under their skin. The project will be considered a full success when the population in the wild is capable of perpetuating itself without the addition of new pigeons from the aviary. Novak expects this to occur as early as 25 years after the first birds are let into the wild, or 2060. And he hopes that he will be there to witness it. While Novak’s pigeons are reproducing, Revive & Restore will have embarked on a parallel course with a number of other species, both extinct and endangered. Besides the woolly mammoth, candidates include the black-footed ferret, the Caribbean monk seal, the golden lion tamarin, the ivory-billed woodpecker and the northern white rhinoceros, a species that is down to its final handful of members. For endangered species with tiny populations, scientists would introduce genetic diversity to offset inbreeding. For species threatened by contagion, an effort would be made to fortify their DNA with genes that make them disease-resistant. Millions of North American bats have died in the past decade from white-nose syndrome, a disease named after a deadly fungus that was likely imported from Europe. Many European bat species appear to be immune to the fungus; if the gene responsible for this immunity is identified, one theory holds that it could be synthesized and injected into North American bats. The scientific term for this type of genetic intervention is “facilitated adaptation.” A better name for Revive & Restore would be Revive & Restore & Improve. The first question posed by conservationists addresses the logic of bringing back an animal whose native habitat has disappeared. Why go through all the trouble just to have the animal go extinct all over again? While this criticism is valid for some species, the passenger pigeon should be especially well suited to survive in new habitats, because it had no specific native habitat to begin with. It was an opportunistic eater, devouring a wide range of nuts and acorns and flying wherever there was food. More pressing to conservationists is a practical anxiety: Money. De-extinction is a flashy new competitor for patronage. As the conservationist David Ehrenfeld said at a Revive & Restore conference: “If it works, de-extinction will only target a very few species and is extremely expensive. Will it divert conservation dollars from tried-and-true conservation measures that already work, which are already short of funds?” This argument can be made for any conservation strategy, says the ecologist Josh Donlan, an adviser to Revive & Restore. “In my view,” Donlan wrote in a paper that is scheduled to be published in the forthcoming issue of Frontiers of Biogeography, “[the] conservation strategies are not mutually exclusive — a point conservation scientists tend to overlook.” So far this prediction has held up. Much of the money spent so far for sequencing the passenger-pigeon genome has been provided by Beth Shapiro’s U.C.S.C. research budget. Revive & Restore’s budget, which was $350,000 last year, has been raised largely from tech millionaires who are not known for supporting ecological causes. 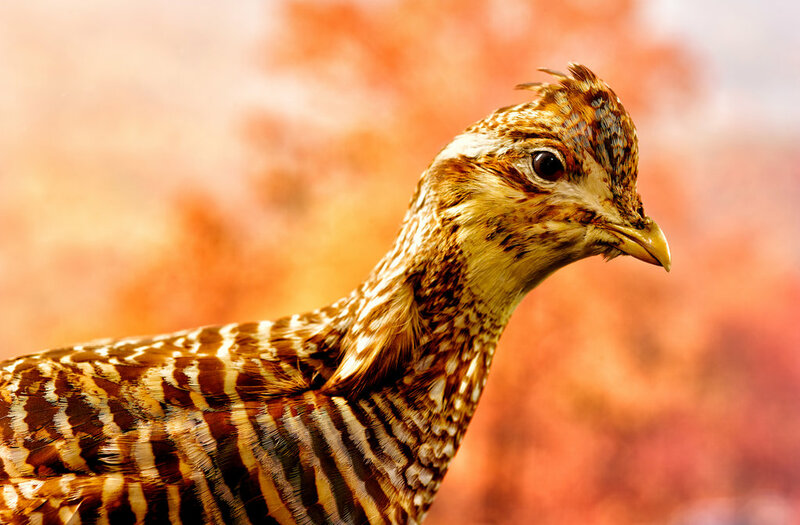 The extinct heath hen, a candidate for resurrection. CreditStephen Wilkes for The New York Times. Heath hen: Museum of Comparative Zoology, Harvard University. Ben Novak — who trails Simberloff in professional stature by a doctorate, hundreds of scientific publications and a pair of lifetime-achievement awards — rejects this view. “This is about an expansion of the field, not a reduction,” he says. “We get asked these big questions, but no one is asking people who work on elephants why they’re not working with giraffes, when giraffes need a lot more conservation work than elephants do. Nobody asks the people who work on rhinos why they aren’t working on the Arctic pollinators that are being devastated by climate change. The panda program rarely gets criticized, even though that project is completely pointless in the grand scheme of biodiversity on this planet, because the panda is a cute animal.” If the success of de-extinction, or even its failure, increases public awareness of the threats of mass extinction, Novak says, then it will have been a triumph. And, finally, what will the courts make of packs of woolly mammoths and millions of passenger pigeons let loose on the continent? In “How to Permit Your Mammoth,” published in The Stanford Environmental Law Journal, Norman F. Carlin asks whether revived species should be protected by the Endangered Species Act or regulated as a genetically modified organism. He concludes that revived species, “as products of human ingenuity,” should be eligible for patenting. 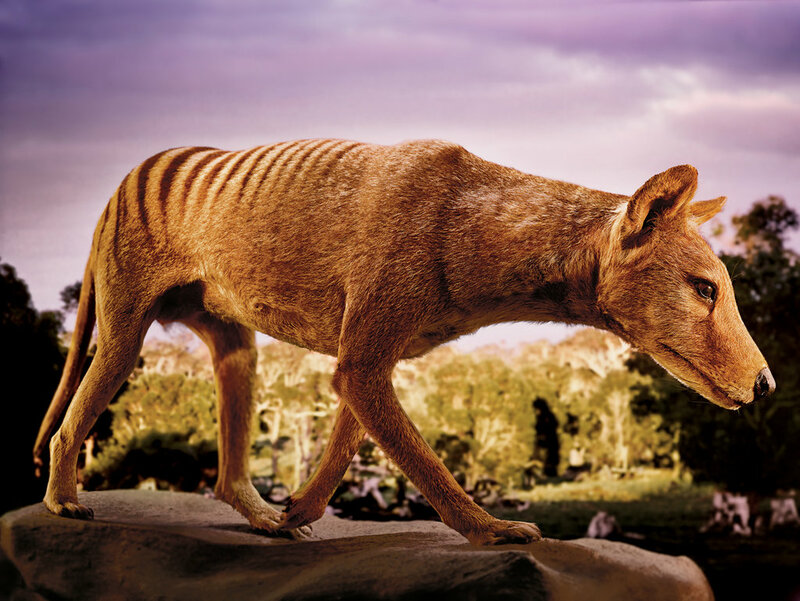 Tasmanian Tiger Also known as the thylacine, it was last spotted in Tasmania in 1930.CreditStephen Wilkes for The New York Times. Tasmanian Tiger, Mammalogy Department, American Museum of Natural History. “By the end of this decade we’ll seem incredibly conservative,” Brand said. “A lot of this stuff is going to become part of the standard tool kit. 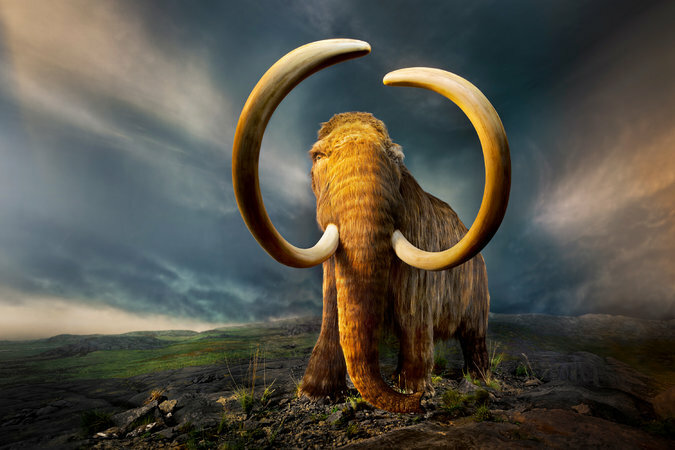 I would guess that within a decade or two, most of the major conservation organizations will have de-extinction as part of the portfolio of their activities.” He said he hoped to see the birth of a baby woolly mammoth in his lifetime. The opening line of the first Whole Earth Catalog was “We are as gods and might as well get good at it.” Brand has revised this motto to: “We are as gods and HAVE to get good at it.” De-extinction is a good way to practice. I repeated what Novak told me, that the passenger-pigeon project was “all under the framework of conservation.” Soares shook his head. “I think the birds are his thing,” he said. Nathaniel Rich is a contributing writer and the author, most recently, of “Odds Against Tomorrow,” a novel.